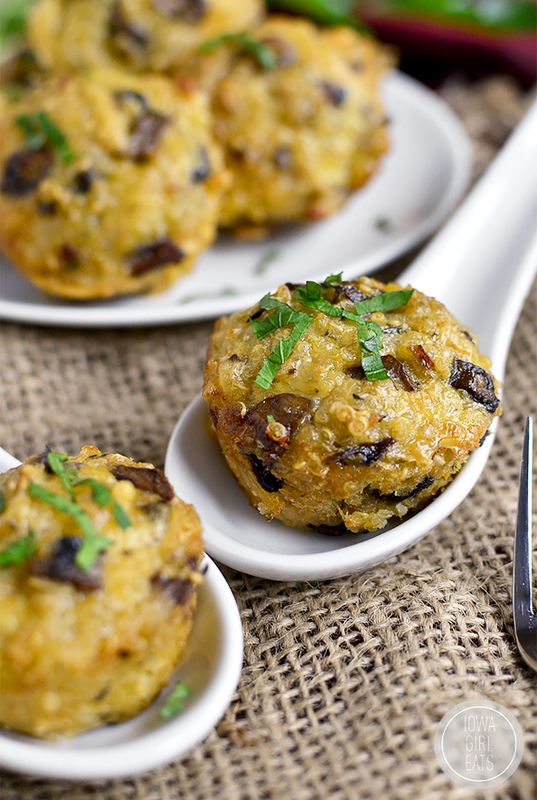 Mini Mushroom and Swiss Quinoa Cups are meatless, gluten-free bites with big, sophisticated flavor. 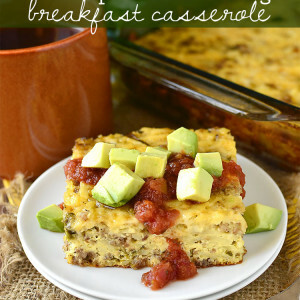 Enjoy for breakfast or a light meal, or as an easy snack! At least once a day I fight the urge to rip open the refrigerator and shout, Mooo-om, do we have anything to eat?! but refrain from doing so because, oh right, I’m the Mom now! Which, poor Moms. I totally remember my brothers and me yelling this phrase with a fierceness everyday after school! Seriously though, do you ever have those weeks when you open the cupboard and refrigerator a hundred times, praying they’ll be magically full of the foods you’re craving on the 101st time? Usually I try and keep fresh fruit and vegetables in the refrigerator, and my gluten-free snack staples in the cupboard, but sometimes I want something more substantial than a snack and don’t have the patience to make a meal. 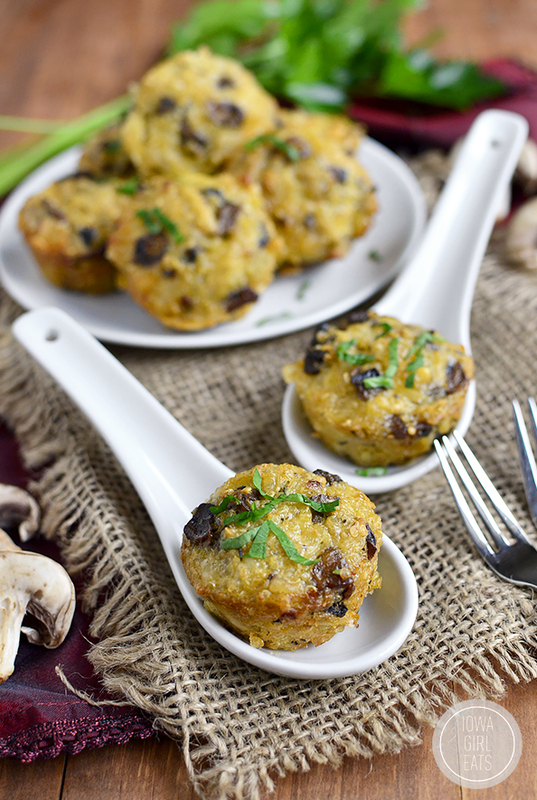 Enter Mini Mushroom and Swiss Quinoa Cups! If you’ve been reading IGE for a few years than you know how obsessed I am with mini quinoa cups. Past cup adventures include Ham and Cheese, BLT, and even Pizza! 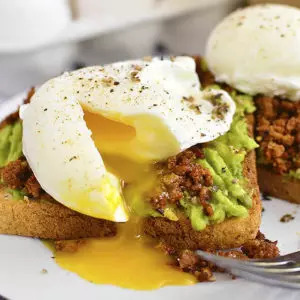 Packed with protein from cooked quinoa and eggs in the mix, they’re totally fun, filling, and perfect for breakfast, a light lunch, or as a snack. Plus they’re freezer-friendly, too. Did I mention completely addicting? I can hardly help myself around these cutie patooties! 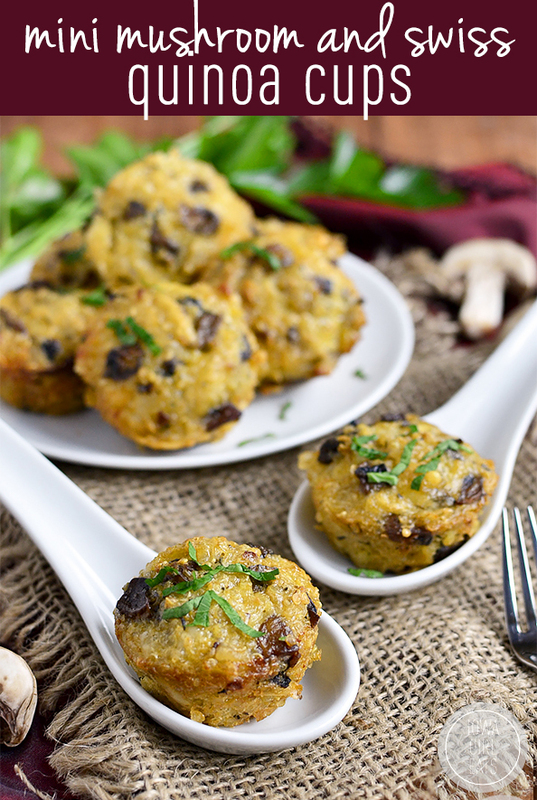 I know I claimed my last version, Mini Pizza Quinoa Bites, to be my favorite, but this mushroom and swiss version is taking it’s rightful place on the throne. Quinoa simmered in chicken broth is paired with freshly shredded swiss and parmesan cheeses, and sauteed mushrooms spiked with lots of dried thyme and tons of garlic. I’m surprised any of the mushrooms actually made it into the mix as I was shoveling them into my mouth like a heathen straight out of the skillet. That is to say, they are so. dang. good! I’ve been eating these cups as snacks but also for breakfast lately. My old standby is 2 over-medium eggs, 3 Jones Dairy Farm sausage links (which I found in bulk at Costco – one of the best moments of my life,) and cauliflower hash browns, but it’s always good to switch things up a bit. 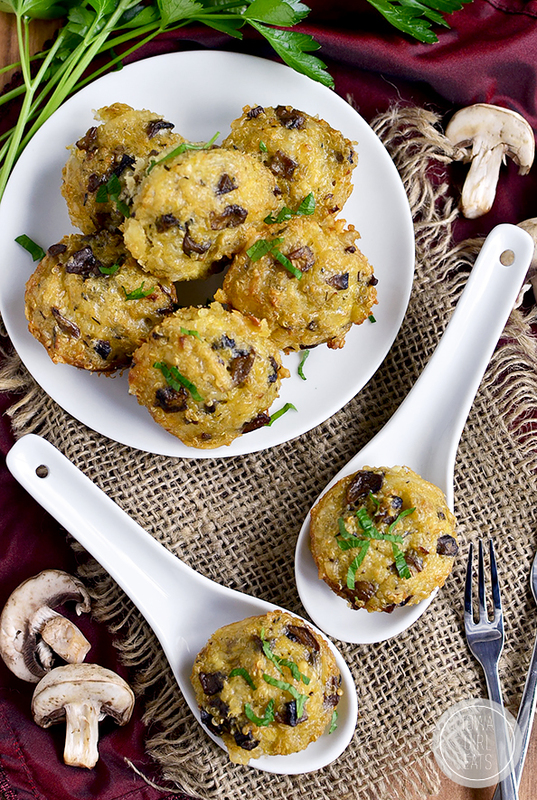 Plus, who wouldn’t want to start their day with the magical combination of mushrooms and garlic? 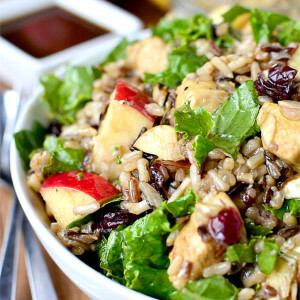 Start by adding 1/2 cup dry quinoa that’s been rinsed and drained to a small saucepan with 1 cup boiling chicken broth. Place a lid on top then turn the heat to medium-low and cook until tender, about 15 minutes, then set aside to cool slightly. 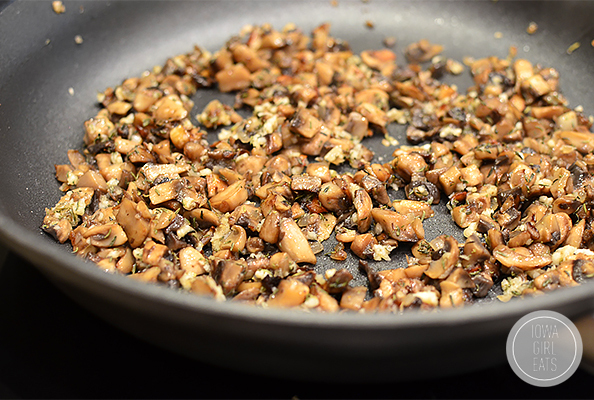 Meanwhile, in a skillet next door, melt 2 Tablespoons butter over medium-high heat then add 8oz chopped mushrooms, 1 chopped shallot, salt and pepper, and then saute until the mushrooms are golden brown and tender, 5-7 minutes. Add 3 cloves minced garlic and 1-1/4 teaspoons dried thyme (garlicky, herby mushrooms – be still my heart!) then saute for another minute. Mushrooms = done! Set ’em aside to cool slightly. Once the quinoa and mushrooms are slightly cool, add them to a big bowl with 1 cup freshly shredded swiss cheese, 1/4 cup freshly grated parmesan cheese, and 2 eggs + 2 egg whites that have been whisked together. Mix everything up then scoop into a 24 count mini muffin tin that’s been sprayed to within an inch of its life with nonstick spray. Trust me – spray, spray, spray – there is nothing worse than having these little gems stick to the pan after coming out of the oven! Bake at 350 degrees for 18-22 minutes, or until light golden brown on top, then cool in the tin before popping out and into your awaiting mouth. Store extras in an airtight container in the fridge for up to five days or cool completely then freeze flat in a Ziplock bag! 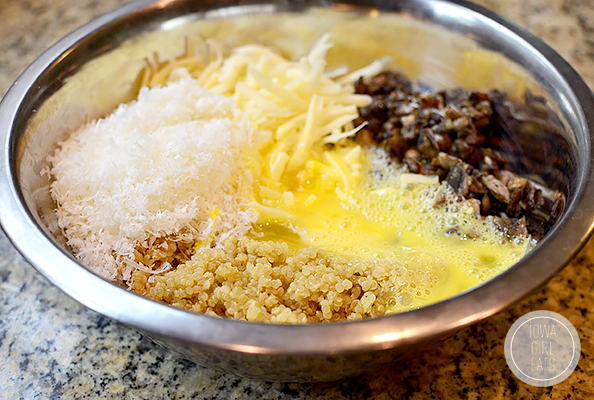 In a large bowl combine cooked quinoa and mushrooms, swiss cheese, parmesan cheese, and whisked eggs then stir to combine. 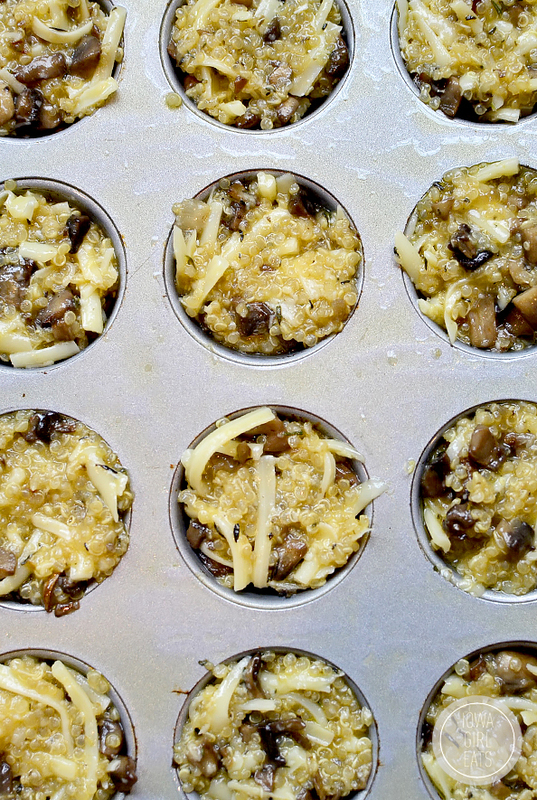 Spray a 24 count mini muffin tin extremely well with nonstick spray then spoon mixture to the top of each cup. 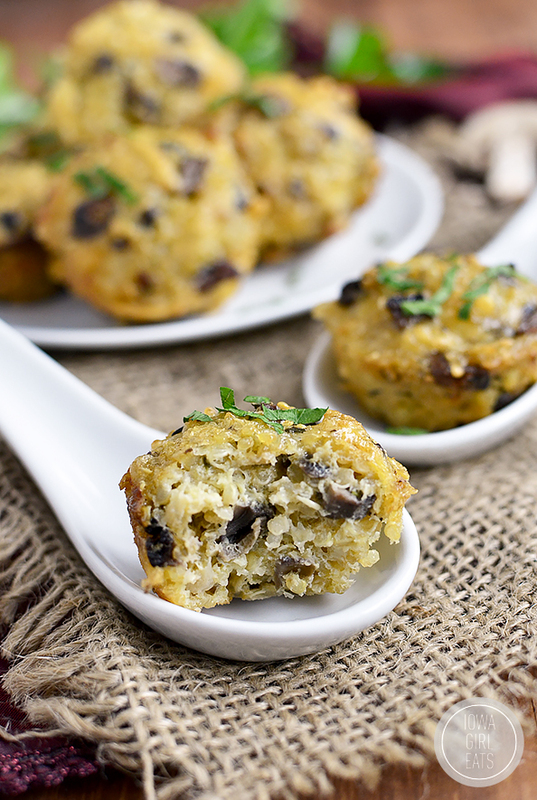 Place muffin tin on top of a baking sheet then bake for 18-22 minutes, or until light golden brown on top. Let cool in tins then store in an airtight container in the refrigerator for up to 5 days. To freeze: Place cups on a baking sheet then freeze until solid, and then transfer to a freezer bag. Place frozen cups on a plate then top with a paper towel and microwave for 20-40 seconds to reheat. To eat the cups from the freezer just place a few on a plate then cover with a paper towel and microwave for 20-40 seconds for a near instant breakfast, lunch, or snack. Enjoy! These are so cute and would make the perfect addition to any packed lunch! You are describing my entire week last week. The hubs had surgery and his home and he eats SO MUCH. I feel like the fridge is constantly empty, and I’m praying for miracles. These are brilliant! These are adorable! And really, how can you go wrong with mushrooms and garlic – and cheese? 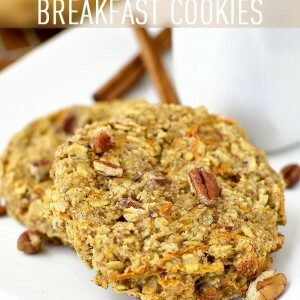 These look like a great alternative to my usual breakfast of scrambled eggs and sausage. Thanks! I am so upset that I can’t just bite the computer screen now and eat these up! If you made them in a regular sized muffin tin (12) how would the baking time change? I would try 20-30 minutes! 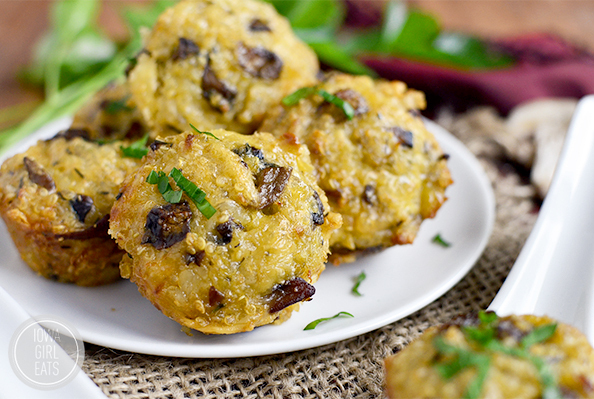 Cauliflower Hash browns?? 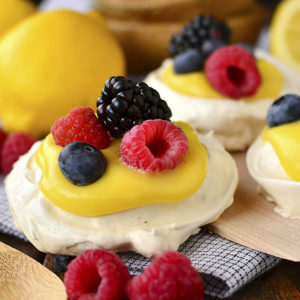 Have you told us how to make those yet? I made these last night, I didn’t have swiss so I used gouda instead…AMAZING! Woohoo – I was actually debating using gouda in the first place so glad to hear it turned out well!! These sound fantastic! If I wanted to add spinach (trying to get more veggies in my diet), would I need to change the recipe? I would cut back a bit on the mushrooms and add the chopped spinach with the garlic to just get it slightly wilted. Hi Emma! Unfortunately the mixture is too wet to scoop onto a cookie sheet (it would all just run together.) I know some people have had success making my previous mini versions in full size muffin tins though, if you have that! These are just amazing!! I lived on these last week after surgery and guess what made some more just for the week for a lite bite for the first week back. This will be made a lot in my household. Awesome! So glad you enjoyed, and thanks for the great feedback. Hope you are recovering well! Hi Kristin – are these supposed to be hot when eaten? Or room temp? I want to make a batch for the next few days. Should I reheat them before eating? PS – I meal plan around your blog. You are an integral part of my family. Thank you for sharing your gift! 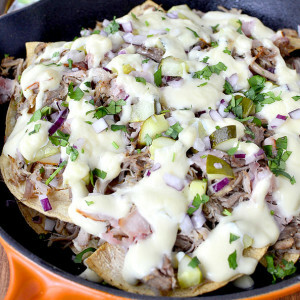 Kristin, This recipe looks awesome. However, my wife and I are vegetarians. Could we sub vegetable stock for the chicken broth? These are AMAZING! Any chance you have the nutrition information on them per serving size?